This entry was posted in Offline maps and storage, Purchases on 24 October 2016 by frogsparks. 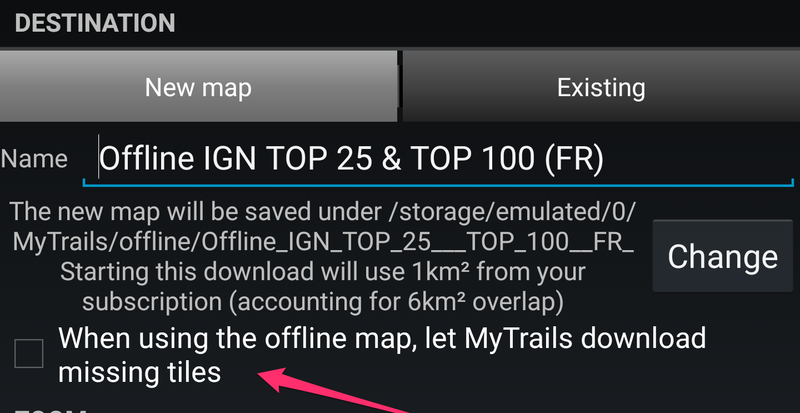 So you’ve downloaded a bunch of maps offline, and MyTrails placed them on your phone’s internal storage? If step 3 sounds too tedious, you can skip it; the next time MyTrails starts (you can stop it manually to make this happen sooner), it will automatically regenerate the map definitions for you (but it leaves the old ones, you’ll need to hide them in MyTrails > Maps, or delete them by long-pressing the map names and selecting Delete – make sure not to delete the map data, just the definition!). If this does not succeed, please use the reset offline hidden option. This entry was posted in Offline maps and storage on 23 January 2015 by frogsparks. 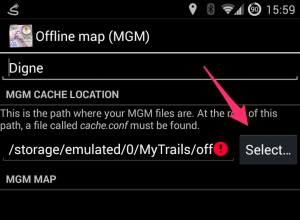 How can I use my external SD card for offline maps on KitKat or later? One of the new “features” of Android 4.4 (KitKat) is that applications can no longer use the external SD card as a generic storage volume and read/write everywhere. There are valid security reasons for the change, but the way Google has done this breaks many apps and doesn’t provide a clear way to do things right for application developers. This entry was posted in FAQ, Offline maps and storage on 7 April 2014 by frogsparks. Why don’t I see my offline maps when I connect my phone to my computer via USB? This should only happen on CyanogenMod-based ROMs. 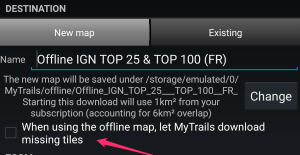 In order to avoid having the Android Media Manager index all the files MyTrails uses for offline maps (thus wasting space and battery on every startup), MyTrails adds a .noscanandnomtp file to offline maps. This in turn prevents MTP (which your desktop uses to connect to the phone) from seeing these files. you will then be able to see the map (or its archive) through MTP. This entry was posted in FAQ, Offline maps and storage and tagged maps on 25 September 2013 by frogsparks. How can I create offline maps from GeoPDF sources? John Thorn, the developer of mapc2mapc has documented the process. This entry was posted in FAQ, Offline maps and storage on 31 October 2012 by frogsparks. This entry was posted in FAQ, Offline maps and storage on 23 April 2012 by frogsparks.